Madonna and her six children returned to Malawi on Monday to visit the Mercy James Institute for Pediatric Surgery and Intensive Care at the Queen Elizabeth Central Hospital in Blantyre. Madonna shared new insight on the challenges she faced adopting daughter Mercy James from Malawi as she opened a new pediatric surgery and intensive care center in the African country Tuesday. The hospital, which she named after Mercy, is the first of its kind in Malawi. Madonna said the judge on her case would not allow her to adopt Mercy because she was divorced, according to People. 'She informed me, as a divorced woman, that I was not fit to raise children and that Mercy was better off growing up in an orphanage,' she told the audience. But that didn't stop her from fighting for then four-year-old Mercy, who is now 11. Mercy James also gave brief remarks. Here is a news report from Malawi which includes Madonna's speech at the opening of the Mercy James Institute for Pediatric Surgery and Intensive Care at the Queen Central Hospital in Blantyre. And while President Peter Mutharika's phrasing was meant to reference Madonna's own adoption of four children from Malawi, the singer has tight enough connections of her own to the country for it to feel like home. Since founding the nonprofit Raising Malawi in 2006, the charitable star has led a continuous effort to support the nation's orphaned or otherwise vulnerable children - whether through hosting benefits, producing a documentary and, now, opening the Mercy James Institute of Pediatric Surgery and Intensive Care, the first of its kind in the country. The singer's efforts haven't come without inevitable road blocks - not to mention a few controversies. But if our roundup of the landmark moments in Madonna's charity efforts in the African country is any indication, the singer will continue to be a 'daughter' of Malawi for years to come. The Day has Finally arrived and so have we! US pop superstar Madonna on Tuesday took her four adopted Malawian children to the opening of a paediatric hospital wing that her charity has built in their home country. Standing alongside President Peter Mutharika, she unveiled a plaque to mark the completion of the 50-bed facility in Malawi's second city of Blantyre. The Mercy James Institute of Paediatric Surgery and Intensive Care - named after one of her children - has taken two years to build and includes three specialist operating theatres. It is the first health unit for children in the southern African nation, and will doubled the capacity for paediatric care at the Queen Elizabeth hospital. Madonna, who set up her 'Raising Malawi' charity in 2006, was greeted by traditional dancers and given a one-hour tour of the hospital, which was decorated with national flags and bunting. The wards have been designed with murals including images of Nelson Mandela and archbishop Desmond Tutu, while US actor Leonardo DiCaprio was listed on a wall as a major benefactor. Mutharika cut a blue ceremonial ribbon, and held it up to the cheering crowd. Madonna has not always been welcomed with open arms in one of the world's poorest countries, where some activists accuse her of using her wealth to short-cut the adoption process. In 2013, she was stripped of her official VIP status in Malawi by then president Joyce Banda's government, which accused her of being 'uncouth' and expecting gratitude for her adoptions. President Mutharika has since moved to repair the relationship, previously saying his government had 'always been grateful for the passion Madonna has for this country'. On our way to Blantyre! Madonna is in Malawi for the official opening of a hospital children's wing that her charity funded. The Mercy James Institute for Pediatric Surgery and Intensive Care, located at the Queen Elizabeth Central Hospital in the city of Blantyre, was built in collaboration with Malawi's health ministry. It has already started some activities and the pop star said last week that the institute had completed its first surgery. President Peter Mutharika was to attend the official opening Tuesday. Madonna has adopted four children from Malawi: David Banda, Mercy James, Stelle and Estere. The children's wing was named after 11-year-old Mercy. Madonna's charity, Raising Malawi, has built schools in the southern African country and funded the new pediatric unit, which began construction in 2015. Madonna, 58, visited the site last year. Madonna says the children's wing at a hospital in Malawi she has been building for two years completed its first surgery last week and will officially open July 11. 'When you look into the eyes of children in need, wherever they may be, a human being wants to do anything and everything they can to help, and on my first visit to Malawi, I made a commitment that I would do just that,' Madonna said in a statement to The Associated Press. 'I'd like to thank everyone who has joined me on this unbelievable journey. What started out as a dream for Malawi and her children has become a reality, and we couldn't have done it without your support,' she added. Madonna adopted four children, David Banda, Mercy James, Stelle and Estere from Malawi. The children's wing was named after 11-year-old Mercy. The pop star's charity, Raising Malawi, has built schools in Malawi and has funded the new pediatric unit, which began construction in 2015. Madonna, 58, visited the site last year. The children's unit includes three operating rooms dedicated to children's surgery, a day clinic and a 45-bed ward. It will enable Queen Elizabeth hospital to double the number of surgeries for children and will provide critical pre-operative and post-operative care. It also includes a playroom, an outdoor play structure and inspirational murals curated by Madonna and other artists. Sarah Ezzy, executive director of Raising Malawi, said the charity has been working with Queen Elizabeth hospital since 2008, helping the hospital's chief of pediatric surgery, Dr. Eric Borgstein, develop a training program. 'Hundreds of thousands, if not millions of lives, will be saved by the hospital in the course of it operating,' added Neilson, who has worked on charity projects with Bill Gates, former U.S. President Bill Clinton, Bono and others. Madonna founded Raising Malawi in 2006 to address the poverty and hardship endured by Malawi's orphans and vulnerable children. 'Malawi has enriched my family more than I could have ever imagined. It's important for me to make sure all my children from the country maintain a strong connection to their birth nation, and equally important to show them that together as humans we have the power to change the world for the better,' Madonna said. After many years of hard work and support from partners and donators from around the world, Madonna and Raising Malawi are delighted to announce that The Mercy James Centre for Pediatric Surgery and Intensive Care will officially open on July 11, 2017! Join the event now and start sharing the info, posts and photos we’ll be adding throughout the week and until July 11 with your friends, family and fellow Madonna fans! After two years of hard work and support from partners and donators from around the world, Madonna and Raising Malawi are delighted to announce that The Mercy James Centre for Pediatric Surgery and Intensive Care will officially open on July 11, 2017! Thanks to every nurse, doctor, company, construction foreman (the list goes on) who have dedicated time, energy and effort to making this project a success. The facility will be the country’s first and only pediatric surgery and intensive care unit. To celebrate her birthday back in 2016, Madonna launched a fundraising campaign with Omaze, inviting her fans to help create a 'Rebel Heart' playroom in the pediatric facility. The new space is now ready to provide a calm, joyful space for the children to play and learn, which will help improve both their physical and emotional health. Later that year, Madonna hosted a special event at Art Basel Miami to benefit Raising Malawi and the Mercy James Centre. Profits from the evening were used to fill the hospital with equipment, surgeons and medical personnel. Stay tuned to Raisingmalawi.org and Madonna.com, within the next days for more info and interesting facts about the hospital, its doctors and nurses, and for ways to get involved and to be a part of this historical and fantastic event! 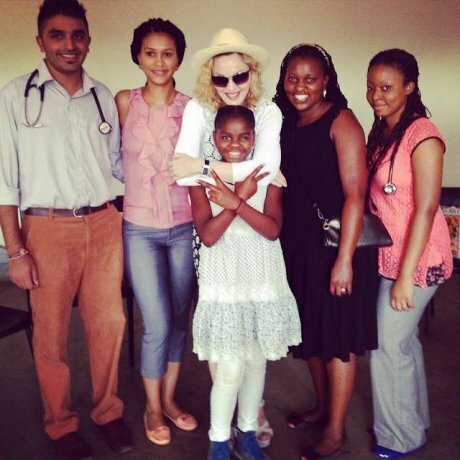 Madonna has been sharing more pictures from her trip to Malawi on her Instagram page, this time from her visit to The Queen Elizabeth Central Hospital in the southern city of Blantyre. Madonna in Malawi on Sunday visited the construction of a children's wing at a hospital that her charity is funding in this southern African country's largest city, Blantyre. The pop star has been in Malawi for a week and is to meet President Peter Mutharika and health minister Peter Kumpalume. Madonna went to visit Queen Elizabeth Central Hospital to view the paediatric unit where construction started in May 2015 and which is expected to open in early 2017. Answering questions from the press, Madonna said that she does not yet have a name for the new children's wing. The children's unit will include Malawi's first paediatric intensive care unit, three operating rooms dedicated to children's surgery, a day clinic and a 50-bed ward. It will enable Queen Elizabeth hospital to double the number of surgeries for children and will provide critical pre-operative and post-operative care. Pop diva Madonna and her two adopted Malawian children have flown into the impoverished southern African nation to inspect a hospital project she is funding there, her charity Raising Malawi said Friday. It is the first time in nearly two years that Madonna has visited the country, where she has at times been embroiled in controversy after her adoption of David Banda in 2006 and Mercy James in 2009. She is reportedly the biggest individual donor to children’s projects such as orphanages in Malawi, which is ranked by the UN Human Development Index as one of the world's 20 least developed countries. Her latest project is a 50-bed surgical unit for children at the Queen Elizabeth hospital in the commercial capital Blantyre, complete with three operating theatres, a day clinic and the country’s first paediatric intensive care unit. 'The facility being funded by Madonna will greatly assist us because it will be particularly equipped for children's surgery,' paediatric specialist Eric Borgstein told AFP. Borgstein, who is a partner in Raising Malawi and one of just three paediatric surgeons in the country, said the unit would double the hospital's capacity for surgery on children. The current intensive care unit of the poorly-equipped hospital, which was built in 1958 and serves the 600,000 population in Blantyre, has just four beds. Madonna, who has reportedly rented the entire upmarket Kumbali Country Lodge near the capital Lilongwe to ensure her privacy, will visit the project on Sunday. It is due to be completed by the end of the year. Happy Holidays! It's been a great year for Raising Malawi! Madonna left Malawi on Monday after a visit that included meetings with the president and the biological father of one of her adopted children. Sarah Ezzy, director of the U.S. pop star's charity Raising Malawi, confirmed Madonna's departure on her private jet. Madonna has been visiting Malawi since 2006. She funds a number of orphanages and schools in the country. On Thursday, she helped open a new 50-bed pediatrics ward in the commercial capital, Blantyre, that she helped fund. On this visit, Madonna met President Peter Mutharika as well as Yohane Banda, father of her adopted son, 9-year-old David Banda. Madonna has another Malawi-born child, Mercy Chifundo James. 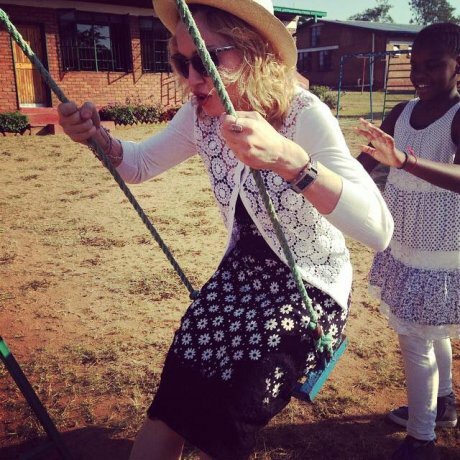 Madonna posted lots of pictures from her visit to Malawi on her Instagram page, including visits with David and Mercy to the Home of Hope and a primary school. Madonna is seen at State House in Lillongwe Malawi, Friday, Nov, 28, 2014, during her meeting with the Malawian President Peter Mutharika at State House. Mutharika thanked Madonna for agreeing to fund the construction of a new state of the art Paediatric Surgery and Intensive Care Unit in the country. Madonna is currently visiting Malawi, where she has been working since 2006 with her non profit organization, Raising Malawi. Pop diva Madonna met Malawi's new president Friday after her VIP status was restored in the country where she adopted two children but then fell foul of the former government. President Peter Mutharika hailed Madonna for her charity work in the poor southern African nation, saying "my government has always been grateful for the passion Madonna has for this country." It was Madonna's first visit in more than a year after she was stripped of her VIP status by former president Joyce Banda amid controversy over the cancellation of her plans for an academy for girls. 'Her VIP status has been restored,' presidential press secretary Frederick Ndala told AFP. Mutharika said the singer's passion was directed 'especially towards addressing poverty and hardships endured by Malawi's orphans and vulnerable children through her charity Raising Malawi'. Madonna has adopted two children - Mercy James and David Banda - from the country, which officially has more than a million orphans and vulnerable children. 'During our discussion, Madonna displayed much commitment in helping to build more classrooms in schools across Malawi,' said Mutharika, who described himself as 'a fan of her music'. He thanked her for honouring her promise to bring her two adopted children along for the week-long visit. The singer did not speak to the assembled journalists and was whisked away by her security detail soon after meeting the president at Kamuzu Palace in the administrative capital Lilongwe. Madonna lost favour with the previous government after cancelling the construction of a $15 million academy which was meant to offer 500 scholarships to girls from poor backgrounds. 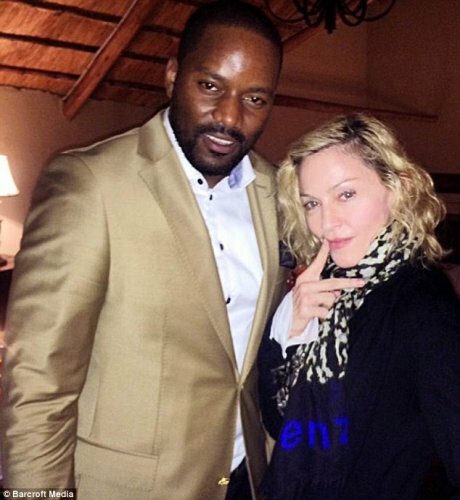 Madonna met Malawian hip hop star Tay Grin at a party to celebrate her first visit to the African country for 18 months. Madonna and Tay are said to have talked for a while and briefly sang together at the party infront of guests. Tay Grin, also known as 'Nyau King', is Malawi's number one hip hop star and this year scooped the Best International African gong at the Black Entertainment Film Fashion Television and Arts awards in London. Madonna has returned to Malawi for the first time since she had a public spat with the southern African country's former president Joyce Banda over her charitable projects, as the new president extended an olive branch. The pop star landed in the capital Lilongwe at around 11am on Wednesday, accompanied by David Banda and Mercy Chifundo, two children she adopted from the country, and her 14-year-old son Rocco along with an entourage that included advisers and bodyguards. On Friday, Madonna is due to meet Malawi's new president Peter Mutharika, who took over from Joyce Banda at the last elections. Madonna and Mrs Banda had a series of public disagreements after the pop star sacked her sister, Anjimile Mtila-Oponyo, as head of her Raising Malawi charity. Madonna tried to meet Mrs Banda during a visit to Malawi last year, but the president said the star was simply trying to get 'poor people to dance for her' and refused, also accusing her of 'blackmail' and 'bullying'. She then stripped the Material Girl singer of her VVIP status, forcing her to check into her private jet at Kamuzu International Airport as an ordinary passenger. On Wednesday, Madonna was restored to VVIP status. 'We were asked to clear the airport's cargo bay for a special guest,' said an airport official. He said Madonna was whisked into a fleet of SUVs and driven into town to Kumbali Lodge, a farm lodge where she always stays on her visits to Malawi. The American star is due to hold talks with Mr Mutharika on Friday at his official resident, the Kamuzu Palace. Trevor Neilson, president of the Global Philanthropy Group which works with Madonna, said her charitable endeavours in Malawi have included building schools for over 1,000 students and funding clinics and orphanages. Pop diva Madonna has weighed in on Malawi's chaotic election, criticising embattled President Joyce Banda, who has tried to nullify the vote amid allegations of irregularities. The superstar, who adopted two children from the southern African nation, has been involved in a long-running spat with Malawi's government over her charity work in the country. 'I am so sad to see that because of the actions of their president Malawians will continue to suffer,' the American singer said. The remarks come after Banda attempted to declare the presidential election 'null and void', prompting fierce legal wrangling over her right to do so. But after a visit to the country last year Banda's government accused the 55-year-old of inflating the value of that help, demanding VIP treatment, being 'uncouth' and bullying state officials. In a long statement it said that if Madonna had her way 'the Malawi government and its leadership should have rolled out a red carpet and blast the 21-gun salute in her honour.' When leaving the country, Madonna was for the first time denied use of the VIP section at the airport in Lilongwe. A government spokesman claimed the singer 'wants Malawi to be forever chained to the obligation of gratitude' for having adopted two Malawian children. But Madonna denied 'these ridiculous allegations'. 'I did not ever ask or demand special treatment at the airport or elsewhere during my visit,' she said. During the trip she visited schools her charity has built, flanked by her four children, including David Banda and Mercy James who she adopted from the southern African nation. 'I will not be distracted or discouraged by other people's political agendas. I made a promise to the children of Malawi and I am keeping that promise' she said. Madonna posted this picture and message on her Instagram page, thanking fans for their birthday love and asking them to support one of her heroes. Many of you know Dr. Eric Borgstein, one of Raising Malawi’s long-standing partners and one of my personal heroes. Dr. Borgstein is a pediatric surgeon who provides care to thousands of children in Malawi. When I met with him earlier this year in Malawi, we discussed expanding the pediatric training program that Raising Malawi supports to train more young surgeons in Malawi. To learn more, watch the below video from our team’s latest trip to Malawi. If you are as inspired as I am, please donate. Every dollar donated through this link: http://bit.ly/mbdaymalawi will go to Dr. Borgstein’s program to train more surgeons who are saving the lives of children in Malawi. Malawi's President Joyce Banda was 'incandescent with anger' over a statement labelling US singer Madonna a bully, the BBC has learnt. She was unaware of the harshly-critical statement that was issued by her office following Madonna's recent visit to the country, senior officials have said. The statement accused Madonna of exaggerating her contribution to the country and demanding VIP treatment. Madonna, who was visiting her charity in Malawi, hit back at the criticisms. She described them as lies and said she began her involvement in Malawi seven years ago 'with honourable intentions'. A well-placed source told the BBC that President Banda was 'incandescent with anger' when she heard about the statement, and a senior official has confirmed she knew nothing about it. The statement, issued on Wednesday, accused the star of wanting Malawi 'to be forever chained to the obligation of gratitude'. It claimed Madonna believed the government should have 'rolled out a red carpet and blast the 21-gun salute' upon her arrival in Malawi. 'Granted, Madonna is a famed international musician. But that does not impose an injunction of obligation on any government...to give her state treatment. Such treatment, even if she deserved it, is discretionary not obligatory,' the statement said. And, in reference to a row over whether she is building schools or classrooms, it said she 'needs to learn as a matter of urgency...the decency of telling the truth'. Emily Banda, head of Malawi's NGO board, said that although President Banda 'did not approve' or indeed know about the statement, there would be no apology for the mistake. Some of the criticism of Madonna's charity work was justified, she said. Madonna, who has adopted two children from Malawi, originally planned to build an $15m (£9.9m) girls' academy. But two years ago she closed down the Malawian office of her charity Raising Malawi, which was headed by President Joyce Banda's sister, Anjimile Mtila-Oponyo - who now works at the education ministry - and opted to fund 10 schools instead. Earlier this month, Malawi's education minister Eunice Kazembe said Madonna was building classrooms, not entire schools, in the country. 'She has built classrooms at existing schools...really it's a difference in terminology,' the minister said. Trevor Neilson, who is now managing Raising Malawi projects, said $400,000 had been spent on building the 10 school blocks allowing some 4,000 children, who had been learning under trees, to be taught in classrooms. On Thursday, Raising Malawi put out a statement saying that Madonna 'did not ever ask or demand special treatment at the airport or elsewhere' during her visit. She said she saw 'with my own eyes the 10 new primary schools in Kasungu province that Raising Malawi...completed this year'. 'Madonna is not letting politics stand in the way of her deep commitment to help build schools there and educate as many children as possible,' the statement also said. There have been many reports regarding Madonna’s recent visit to Malawi. Some of these reports include inaccurate information and accusations by the Malawian Government on Madonna’s character and the work of her foundation Raising Malawi. Despite the accusations, Madonna and her organization Raising Malawi remains committed to the health and education of the children of Malawi. 'I was very happy to visit with the children of Malawi earlier this month and to see with my own eyes the ten new primary schools in Kasungu province that Raising Malawi and buildOn completed this past year. These schools are now educating more than 4,800 children with girls attending in equal numbers. These children who were formerly learning outside on the ground, in unsafe buildings or not at all, now get to attend classes on a daily basis. My children and I were overjoyed to visit these schools and see what amazing progress has been made. I will continue to follow through on my commitment to help educate the children of Malawi. I’m saddened that Malawi’s President Joyce Banda has chosen to release lies about what we’ve accomplished, my intentions, how I personally conducted myself while visiting Malawi and other untruths. I have no intentions of being distracted by these ridiculous allegations. I came to Malawi seven years ago with honorable intentions. I returned earlier this month to view the new schools we built. I did not ever ask or demand special treatment at the airport or elsewhere during my visit. I will not be distracted or discouraged by other people’s political agendas. I made a promise to the children of Malawi and I am keeping that promise' commented Madonna. Madonna originally planned on building a Girls Academy in the impoverished country but realized that a more sustainable model would be to build smaller schools in villages around the country with buildOn who have had 20 years of success building schools in Africa. The original team that Raising Malawi first put in place included Anjimile Oponyo, the sister of Malawi’s current President Joyce Banda. Due to major organizational problems that occurred during that time, the original team was disbanded. President Banda has since appointed her sister to a senior post within the Ministry of Education. Madonna’s decision to change course on her education projects has subsequently been met by deep resistance from Oponyo, the President, and the Ministry of Education. But Madonna is not letting politics stand in the way of her deep commitment to help build schools there and educate as many children as possible. In addition to the school projects, Raising Malawi has spent millions of dollars in Malawi to support orphans and vulnerable children through multiple community-based organizations. This includes Home of Hope which supported 595 beneficiaries including orphans, vulnerable children and their caregivers in 2012 alone. Raising Malawi also supports Dr. Eric Borgstein, one of three pediatric surgeons in Malawi. Dr. Borgstein performed more than 500 surgeries in 2012 alone and he sees thousands of children each year. 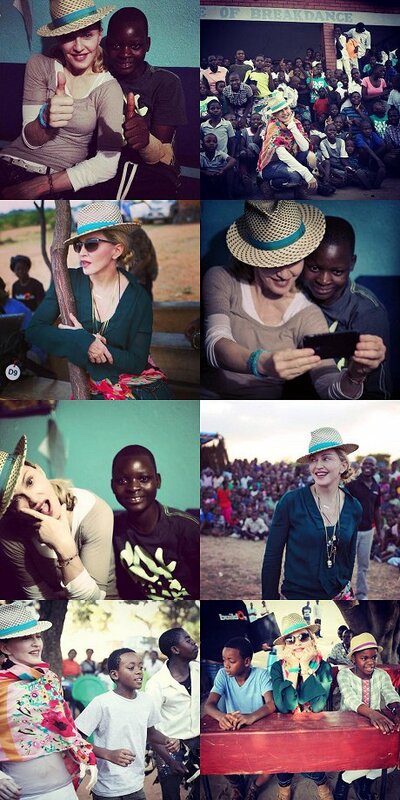 Madonna has left Malawi after visiting the projects she has helped support through her Raising Malawi charity. The pop diva and her four children arrived in the southern African country Monday and left Saturday. Madonna visited the 10 school blocks that her charity has helped build or renovate in collaboration with BuildOn. The singer also visited a hospital's pediatric ward and several orphanages, including the Home of Hope, where she adopted David Banda in 2006. She also adopted Mercy James from Malawi in 2009. Madonna initially planned to build a $15 million 500-bed Raising Malawi Academy for girls, before changing plans to help fund several community schools, which led to some controversy in Malawi. She also closed the Malawi office of Raising Malawi and fired staff for misappropriating funds. 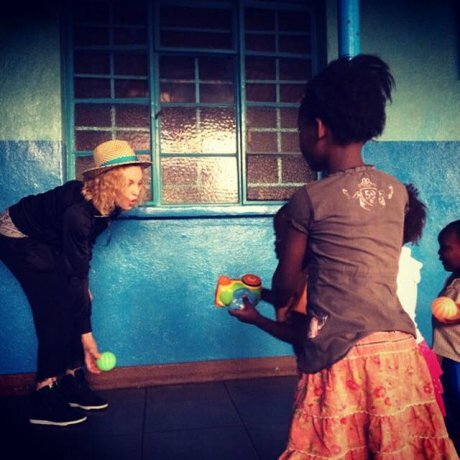 Madonna has returned to the orphanage where she adopted one of her Malawian children. The pop star was welcomed with song and dance from youngsters at the Home of Hope, from where she adopted David Banda in 2006. She said she was pleased to visit the orphanage, in the western district of Mchinji near the Zambian border. 'I'm happy that David is back to see his brothers and sisters,' she said. David, now eight, was accompanied by his sister Mercy James, also eight and adopted from Malawi, and Madonna's natural children, Rocco and Lourdes. The visit saw him taken to see his former crib, which has been preserved in his memory. It was not known if the family would also visit the Kondanani Children's Village, where Madonna adopted Mercy in 2009 after a protracted court battle. The singer arrived in Malawi on Monday to visit projects she has supported. She had initially planned to build a $15m (£10m), 500-bed Raising Malawi Academy for girls, before changing plans to help fund several community schools. Meanwhile, the singer expects to raise more than $5m (£3.3m) to support education for girls in Afghanistan, Pakistan and other countries by selling an abstract French painting she has owned for more than 20 years. Pop diva Madonna, spending her fourth day in the southern African country of Malawi on Thursday, picked up ailing children and joked with them when she visited an overcrowded children's ward in Blantyre, the country's largest city. 'Muli bwanji? (How are you?)' she greeted them in Malawi's main language, Chichewa. Madonna is the largest individual donor to the hospital and funds programs run by Borgstein that include treating children with cancer, said Trevor Neilson, president of the Global Philanthropy Group that is managing Madonna's projects in Malawi. Born and raised in Malawi, Borgstein said he studied medicine at the University of Groningen in the Netherlands before to returning to his home country. Borgstein said he has been working in children's health for 15 years, treating up to 40 patients daily. 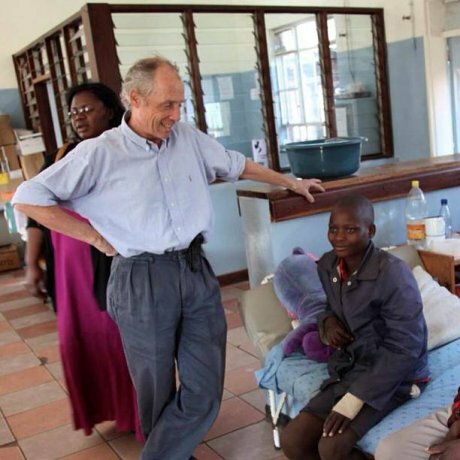 Malawi has only three pediatric surgeons, said Borgstein. On Friday, Madonna is scheduled to visit Consol Homes Orphan Care Centre, 50 kilometers (31 miles) outside the capital, Lilongwe. US pop icon Madonna on Wednesday took her four children to a famous orphanage in central Malawi, from where she adopted one of them, seven-year-old David Banda. Madonna, who adopted David in 2006, last visited the Home of Hope three years ago. The singer also received reports on how the financial support she has provided the orphanage since 2007 have helped the up to 500 children there. When she adopted David, Madonna promised that she would be bringing him home 'to stay connected to his Malawi culture...to keep connected to his cultural heritage'. In 2009, Madonna also adopted Mercy James, now aged seven, from another Malawian orphanage. Trevor Neilson, philanthropy manager for Madonna, told AFP the pop diva was 'continuing her commitment to ensuring the children feel connected to this beautiful country'. Madonna is also travelling with her two biological children Lourdes and Rocco. 'There is incredible joy and enthusiasm. The children of Madonna are dancing together with fellow children here. It brings connection to the people of Malawi,' he said. Madonna arrived in the poor southern African nation, sandwiched between Mozambique, Zambia and Tanzania, on Monday to visit the schools she has built with an organisation called BuildOn. The schools can currently accommodate 4,800 students, but many others still learn under trees. The megastar is also inspecting other charity projects she is funding, including those involved in child care. Madonna, according to Neilson, is the single largest international philanthropic donor to Malawi. Malawi, where nearly half of the 13 million citizens are poor, has over one million orphans and vulnerable children. Schoolchildren joined by hundreds of villagers have danced around pop diva Madonna and serenaded her with praise songs as she inspected school blocks she helped to construct in Malawi. 'Zikomo (Thank you),' said the singer as the Malawians rejoiced at Nkoko Primary School in the central Kasungu district, where she worked with non-profit organisation BuildOn to construct classrooms. Madonna initially planned to build a 15 million US dollar (£10 million) 500-bed Raising Malawi Academy for girls, before changing plans to help fund several community schools to benefit more Malawians. She arrived in Malawi yesterday to tour the 10 school wings she has helped to build. 'I love Malawi, I am committed to help end poverty here,' she said. Madonna is the 'biggest global philanthropist' Malawi has had, said Trevor Neilson, president of the Global Philanthropy Group that is managing the pop star's projects in Malawi. She is exploring more projects she can work on in Malawi, said Mr Neilson. Madonna's efforts have provided new classrooms for more than 4,000 children who were previously learning under trees. 'Madonna is happy that the communities are appreciating her efforts,' he said. She has been joined on her tour by her two adopted Malawian children, David Banda and Mercy James, both now eight. 'We are coming to visit the 10 schools that she recently finished building with an organisation called BuildOn,' said Madonna's philanthropy manager Trevor Nielson. 'Those schools which are now open and operating are serving 3,800 students,' he told AFP. 'There's no controversy, the schools are built to the exact national standards of Malawi, like every other Malawian school,' he said. Initially she wanted to build a large $15-million girls academy, but the plan was abandoned after 'a large amount of money went missing'. The American pop diva Madonna has arrived in Malawi for an unannounced visit, local residents say. An aviation department worker said Madonna’s jet landed at the Kamuzu International Airport in the country’s capital, Lilongwe, early Monday. It was not clear if she came with her children. The aviation worker spoke on condition of anonymity because he did not have permission to speak to the press. The singer previously has stayed at the exclusive Kumbali Lodge in Lilongwe, and an employee there says all other guests were checked out. The employee spoke on condition of anonymity because he didn’t have permission to speak to the press on the matter. The singer, along with the actress Angelina Jolie, was the subject of criticism from Mozambique-born supermodel Tasha de Vasconcelos. But a spokesman for Madonna, who has adopted two children from Africa, called the comments 'reckless'. 'Her children are thriving and well cared-for and are certainly being educated about their culture and where they came from,' the spokesman added. It is rumoured that Madonna was inspired to adopt from Africa after a conversation with Jolie, who adopted Ethiopian baby Zahara Marley to her family in 2005. Ms de Vasconcelos, who was recently made an honorary consul for the G8 to help bridge the gap between Europe and Africa, also attacked Madonna and Jolie for 'throwing money' at Africa without getting involved on the ground. Her charity Amor is set to open an eye clinic in Malawi this year, the charity's second such project. In January of 2012, buildOn partnered with Raising Malawi to build ten two-classroom schools for rural villages of the Kasungu District of Malawi. Each school was built with a corrugated metal roof and poured concrete floor. The locations for each school were chosen in partnership with the District Education Manager’s Office in the Kasungu District. Each village that was selected had no adequate school structure; priority was given to villages with no school infrastructure at all. Prior to buildOn and Raising Malawi, children in these villages attended classes in either a temporary structure or outside under a tree. Each classroom is built to hold 50 children at any given time. Each school was constructed in partnership with the communities who will benefit from the structures. buildOn and Raising Malawi provided the construction materials, transportation, skilled labor, project management, and construction plans. Each partnering community provides a gender-balanced leadership team, volunteer labor, land, local building materials, and authorization from the government to have a school. Each community also agrees that boys and girls will attend schools in equal numbers. The District of Education Manager’s Office in Kasungu has provided 44 educators for the schools who are now teaching the Ministry’s approved curriculum. Once completed each community and school leadership team manages the use of each structure. buildOn has constructed 72 two-classroom schools Malawi since 1993. In 2013, we plan to build 23 additional two-classroom schools in the Kasungu and Neno District of Malawi in partnership with each region’s District Education Manager’s office.